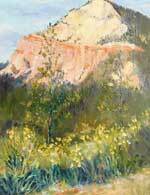 I just got back from participating in the Escalante Canyons Art Festival during a beautiful time of year. I found that it was warm and wonderful and the most healing thing that I have done for myself this year. Arriving emotionally injured, I found that after one week of seeing old friends, painting at beautiful locations and going on a couple of outrageous wilderness hikes – I was once again feeling like Margie. I now look at the 3 paintings (and one quick sketch) and can see the internal transition that progressed inside me. I'll share these with you here. The first one was 'Backbone Pond' – oil on canvas board. 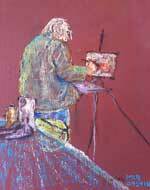 I was forgetting all the rules on this one – even how to use my easel! Remembering by making mistakes, things gradually got better. This beautiful spot is part of an old irrigation system that was put in place generations ago. The owner of Poles Place motel in Boulder (where we spent the night) reported that her great-grandfather built it. Still a functioning part of the system, it also serves as a rich wetland for the coots, geese, frogs and other critters. The second painting, 'Slot Canyon Road' was a pastel on textured hardboard which I painted in the evening on the grounds of the Slot Canyon Inn in Escalante. I had not touched pastels since last April. I am looking forward to doing more. Thirdly, I drove out a forest service road into Dixie National Forest with some great artist friends. The road took us higher and higher until we reached a point that not only overlooked the whole Escalante valley below, but also looked across to marvelous Powell Point. I chose the Powell Point view to paint. I had painted that rock years ago from Bryce Canyon – at a much further distance. I painted 'Powell Point' in oil, but without any more canvas board, I used texted hardbord typically reserved for pastel painting. Why not? This fourth photo is of a very quick sketch that I did of an artist I much admire (Brad). I was invited by my friend Gail to join in under the shelter in an Escalante park during a torrential rain storm. I allowed myself a few moments to be there and felt enriched by the experience. So, back in Moab now, I intend to paint some more. I think I'm getting back in the groove….